Pi Day (March 14th – 3/14 – 3.14) is a celebration of all things pi. Remember from your geometry class that pi is a numerical ratio of the circumference of a circle (how big around it is) to its diameter (how far across it is). It is always the same – a non-repeating infinite series of numbers that begins 3.14159. It is used in all sorts of calculations and is a pretty indispensible mathematical tool. So, to celebrate all things pi, the Children’s Museum of Houston hosts an annual Pi Day event, including math games, puzzles, giant paper chains, etc. However, it also happens to be Albert Einstein’s Birthday! And what is a birthday party without dessert? So, we have started an annual tradition of a pie fight! A glorious spectacle not to be missed that involved 50 Pie Fighters, 55 cans of shaving cream, and over 500 pies! But, just in case you did miss it, enjoy the video of this year’s event! 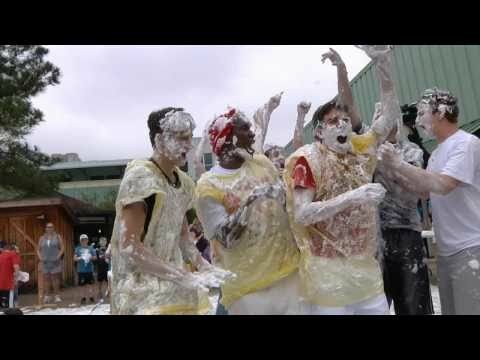 And, if you’d like, here is a link to last year’s Pi Day Pie Fight. Just make sure to come out for next year’s fight! By the way – the pies are shaving cream pies – not exactly tasty. So, we also do pudding pies afterwards for everyone to enjoy! A BIG thanks to Regions Bank for sponsoring our “O Wow Moments”!